Ok, I haven’t seen the Exorcist, but I do know this is an Exorcist themed soap. I also know that “The Witch’s Bath” is a fantastic name for a bath-product shop. 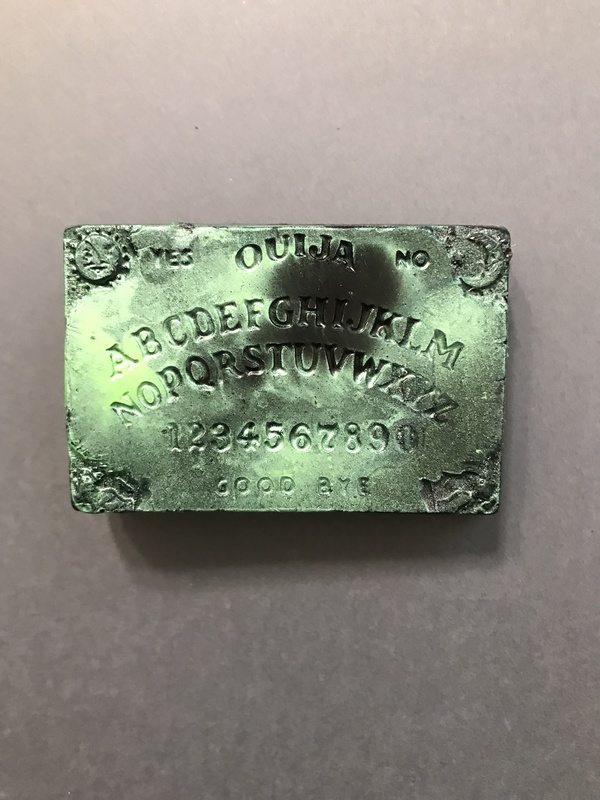 I got this soap in my October Unplugged Book Box, and loved the spooky aesthetic. I’m here for a little bit of glitter, ouija boards, and a whole lot of oak-y smells. But this soap truly was fantastic, and I have to talk about it. I started using this just over a week ago, and I fell completely in love with it. Yes, it was the perfect time; starting a Halloween-y soap around Halloween is (maybe) a little spot on, but I’m one to fight for year-round spookiness, so here we are. This soap is a lovely, oak and woodsy scent, that lathers wonderfully. While the glitter is only on the top (I’m okay with that), it didn’t stick to my body at all. I like glitter better when it washes easily down the drain. I also found that the scent sticks with me a bit; I don’t think it’s overpowering, but I can still smell it on my skin. That was a lovely surprise. It’s also perfectly strong in the shower; the steam and heat really bring the smell out, but again, not overpowering. While I’m not currently in the market for more bath products, this is a company I will be coming back to. The Witch’s Bath has tons of cute and spooky designs, to keep your whole year of bathing slightly spooky. I definitely recommend checking them out, and also Unplugged, the subscription box I got this from! Both are rad brands that deserve all the love in the world. Happy washing!